Nancy Balyeat Framed Watercolor print. 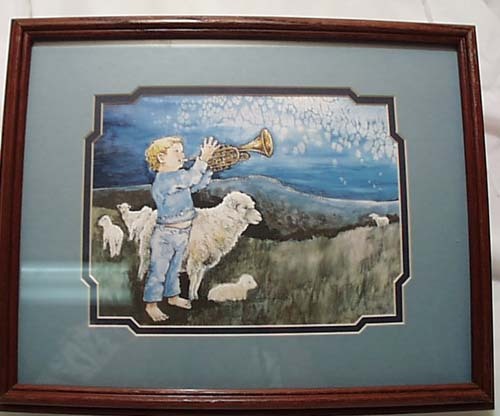 This is a watercolor print of a little boy with sheep and lambs. On the back of the print is a printout of Nancy Balyeat. It says she is a Christian Montana watercolor artist. Her unique trademark is a small verse incorporated into the detail of each painting. In this painting it reads, Announcing Peace, Proclaiming news of Happiness. Nancy started at the age of 16 at the 1974 Worlds Fair at Spokane. This is a beautiful print in shades of blue and has a very nice mat. In excellent condition. This is a wood frame. needs a little touching up on one corner. There is a 3" mark where it could have rubbed against another frame. Easily touched up. This picture as matted is 9 1/2" by 7 1/2" The frame is 13" by 16"
Items Similar To "Nancy Balyeat Framed Watercolor print"
Nancy Balyeat Pure Praise Watercolor print.